Herbert Marcuse was one of the twentieth century's most unlikely pop stars: a celebrity philosopher. 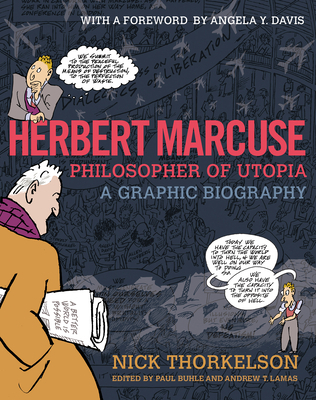 In the 1960s, his argument for a "principled utopianism" catalyzed the idealism of a rebellious generation, and Marcuse became an intellectual guide for activists and revolutionaries around the world. Marcuse's advocacy for a more humane, sustainable world was grounded in a personal knowledge of authoritarianism's violence, and the risk of its resurgence. Perennially relevant, radical, and inspiring, Marcuse's concept of a "Great Refusal"--the protest against that which is--is a guide for our times. Nick Thorkelson is a cartoonist living in Boston. He has done cartoons on local politics for The Boston Globe and in support of organizations working on economic justice, peace, and public health. He is the co-author and/or illustrator of The Earth Belongs to the People, The Underhanded History of the USA, The Legal Rights of Union Stewards, The Comic Strip of Neoliberalism, and Economic Meltdown Funnies, and has contributed to a number of nonfiction comics anthologies. He is working on a graphic novel about the end of the Sixties, A Better World Is Possible. Nick also moonlights as a musician, animator, graphic designer, and painter.Paul Buhle, a journal publisher in the New Left and publisher of one of the first Underground Comix, has written or edited many volumes including the biographies of C.L.R. James, William Appleman Willliams and Harvey Kurtzman, returned to comic art with a dozen volumes since 2005 including The Beats, among other subjects. His works, including comics, have been published in more than a dozen languages. He taught at Brown University until retirement.Andrew T. Lamas teaches urban studies and critical theory at the University of Pennsylvania, is co-editor of The Great Refusal: Herbert Marcuse and Contemporary Social Movements (Temple University Press, 2017), and serves on the boards of the International Herbert Marcuse Society, the Radical Philosophy Review, and the Bread and Roses Community Fund.Angela Y. Davis is the Distinguished Professor Emerita in the History of Consciousness and Feminist Studies Departments at the University of California--Santa Cruz. A former student of Herbert Marcuse, she is the author of many books and articles, including Angela Davis: An Autobiography (1974), Women, Race and Class (1981), Blues Legacies and Black Feminism: Gertrude "Ma" Rainey, Bessie Smith, and Billie Holiday (1998), Are Prisons Obsolete? (2003), Abolition Democracy: Beyond Empire, Prisons and Torture (2005), The Meaning of Freedom and other Difficult Dialogues (2012), and Freedom is a Constant Struggle: Ferguson, Palestine, and the Foundations of a Movement (2016). She is a founding member of Critical Resistance, which is dedicated to the dismantling of the prison industrial complex. She is the subject of the acclaimed documentary Free Angela and All Political Prisoners (2012).